Image credit: Jaap Buitendijk/Warner Bros. The future is like today, but dirtier. Steven Spielberg's adaptation of Ready Player One will be making a big splash at San Diego's Comic-Con next week, but ahead of that Entertainment Weekly has given us our first look at the film. And, well, it looks a lot like the worn out, nostalgia-filled world described in Ernest Cline's popular novel. 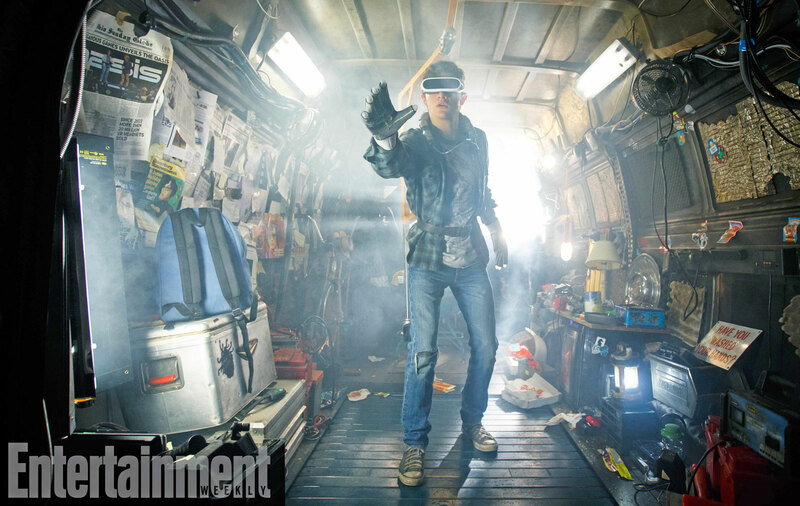 Front and center is Tye Sheridan as Wade Watts (or Parzival online) wearing a VR headset and haptic gloves. He uses that gear to tap into the OASIS, a global virtual reality network that serves as his one escape from his harsh life in the year 2044. What's most interesting about this image is how down-to-Earth everything seems. The VR headset Watts is using doesn't look too far off from what we're seeing today -- in particular, it seems reminiscent of the Windows-powered headsets currently in the works. And we've also seen haptic gloves, like those from Manus, that give us another layer of interaction with virtual worlds. Hopefully at Comic-Con we'll also get a glimpse at how Spielberg will visualize the VR world of the OASIS. The photo, which shows off Watts' private hideout in an old van, packs in plenty of Easter Eggs. There's a classic He-Man lunchbox on the right side, along with some Garbage Pail Kids and Garfield stickers. The newspaper on the left celebrates the launch of the OASIS, as well as the fact that 21 VR headsets had been sold by then. And, it's worth noting that Watt's outfit looks like almost like a character from Back to the Future. There's also a Businessweek cover featuring James Halliday (Mark Rylance), the founder of the OASIS. Shortly before he died, he announced a final game, which involves solving increasingly esoteric pop culture quests. The first person to win it will inherit his fortune, the OASIS and its parent company, Gregarious Games. As you'd expect, the story follows Watts as he tracks down all of the clues for the final game, along with some of online friends (played by T.J. Miller, Lena Waithe and Olivia Cooke). All the while, they're hunted by Nolan Sorrento (Ben Mendelsohn), an employee of the IOI organization, which hopes to take over the OASIS and make it much more expensive for average consumers. Ready Player One is a particularly intriguing project for Spielberg, since his filmography plays a huge impact on the book's 1980's pop culture nostalgia. To avoid getting too self-referential, the director chose to cut most of the book's references to his work, aside from featuring the Delorean from Back to the Future (which he produced). But I'm sure there will still be plenty of Easter Eggs to find when the film hits theaters on March 30th, 2018.